Welcome to the first BYA of the year! Join us on the 20th of September for a talk by our former MSP professor Sarah Williams! The Standard Model of Particle Physics, which explains what the elementary particles in the universe are and how they can interact with each other, has been immensely succesful at describing (nearly) all experimental observations in high energy physics. There are missing ingredients from this model, one of these is dark matter. 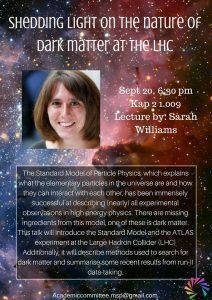 This BYA, lead by Sarah Wiliams, will indroduce the Standard Model and the ATLAS experiment at the Large Hadron Collider (LHC). Additionally, it will describe methods used to search for dark matter and summarise some recent results from run-II data-taking. As always, there will be free admission and snacks are provided! Join us for the BYA/philosophical cafe with Dr. Linda Mbeki at Cafe the Poort. Whilst enjoying a beer engage in conversation with Mbeki about her studies on the poorly documented migration of slaves. As our studies (Arts and Culture) is limited to Western societies this topic is a true addition to your education, and your Tuesday night. In cooperation with “Orakel” from FASOS we are happy to invite you to join us for a unique talk given by Dr. Linda Mbeki at the Café de Poort on Tuesday night. She will tell us about her own investigations in the life histories of enslaved persons at the Colonial Cape. 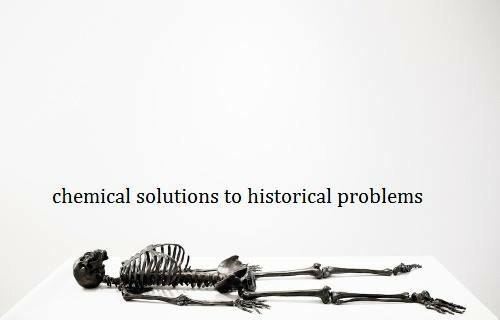 This will give an insight on how means of scientific research can enable different perspectives on historical problems, and how it can allow a deepening of our historical knowledge when written records are biased and incomplete. Linda Mbeki graduated from a liberal arts program with a major in chemistry from Barnard College, Columbia University in 2003. She went on to write her M.Sc. dissertation in synthetic organic chemistry of potential anti-viral and anti-parasitic agents at the University of Cape Town in 2006. Using her chemical knowledge, Linda formed a start-up cosmetics company. Academia remained close to her heart, however, and in 2012 she embarked on a PhD project to investigate the life histories of enslaved persons at the Colonial Cape. In this multidisciplinary project history meets bioarchaeology in an attempt to give a voice to those who have been silenced in life and in death. Admission is FREE, Orakel students and MSP students get a discount on drinks. "Can heavy main group elements bind to transition metals and form multiple bonds ? Until the early 80s, scientists believed this is impossible. 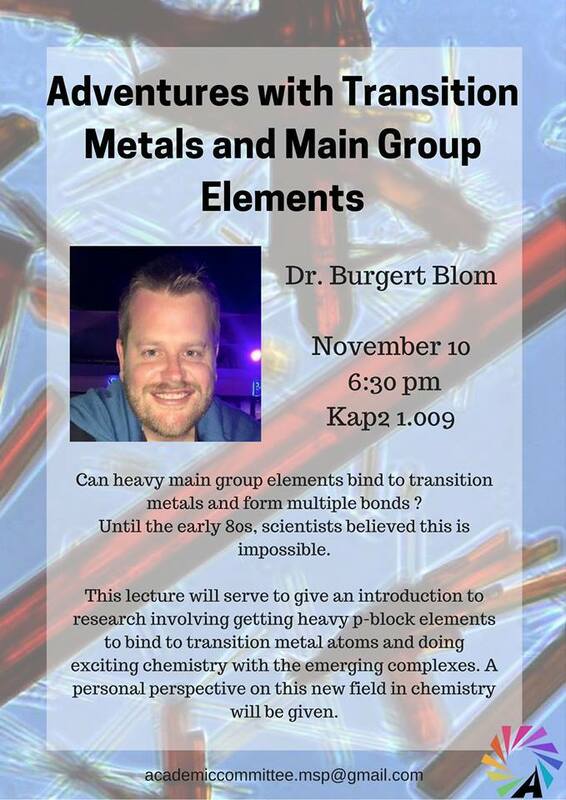 This lecture will serve to give an introduction to my research interests which involve, for the most part, getting heavy p-block elements (like silicon, germanium, tin etc.) to bind to transition metal atoms and doing exciting chemistry with the emerging complexes. 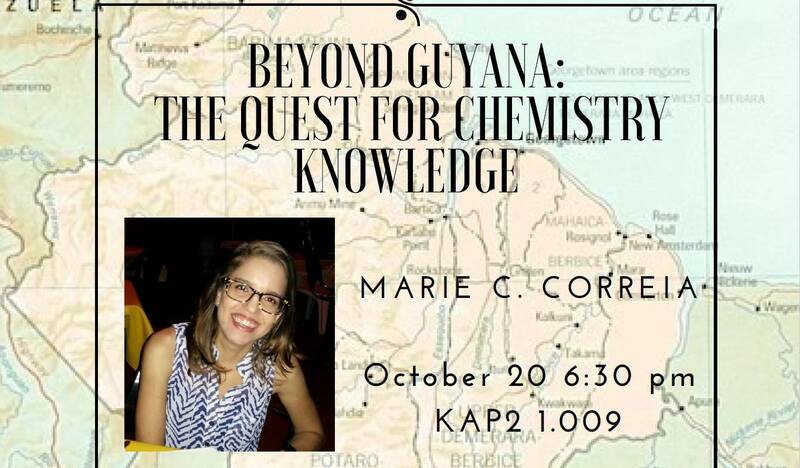 So I will give a personal perspective on this new field in chemistry. I will try to introduce these contemporary ideas in an approachable way, and also talk a little bit about the people I worked with in the last 15 years; from Cape." As in every BYA, free snacks and drinks will be provided. Join us for our 2nd edition of Broaden Your Aperture in the 2016/2017 academic year by Marie C. Correiy. Join us for our 1th edition of Broaden Your Aperture in the 2016/2017 academic year by Dr. Chris Pawley. There can be no doubt that phenomenal developments in science take place every day. Millennials and those in generation Z have become innately comfortable with modern technology, permanent connectivity and of highly pervasive silicon based devices. Of course, in this highly advanced society, it is easy to forget about the pyramid of knowledge that we rely on to use these devices and technologies and of the hard work and scientific breakthroughs that took entire careers to achieve. This talk will highlight some of these important scientific breakthroughs, not selected for their importance for modern life, but so as to highlight the efforts and energy that individuals go to in order to make progress in the scientific community. It will be an anecodal look at some of the interesting moments in science, reflect on the impact this had and will conclude with a short amount of future gazing. 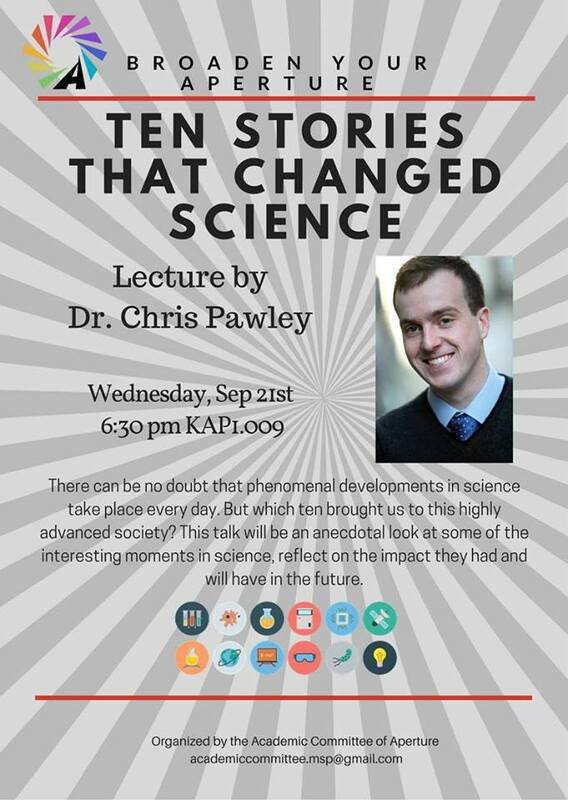 Although Chris is a physicist, this talk is of a general science nature and is aimed at the entire MSP scientific community. Join us for our 8th edition of Broaden Your Aperture by our guest speaker Dr. Erich Uffelman. How we think about and care for cultural heritage objects, particularly those considered as “fine art,” involves thinking at the interface of art history, art conservation, and the physical sciences. This talk will use examples, especially those drawn from 17th-century Dutch painting, to illuminate the interdisciplinary character of such work. 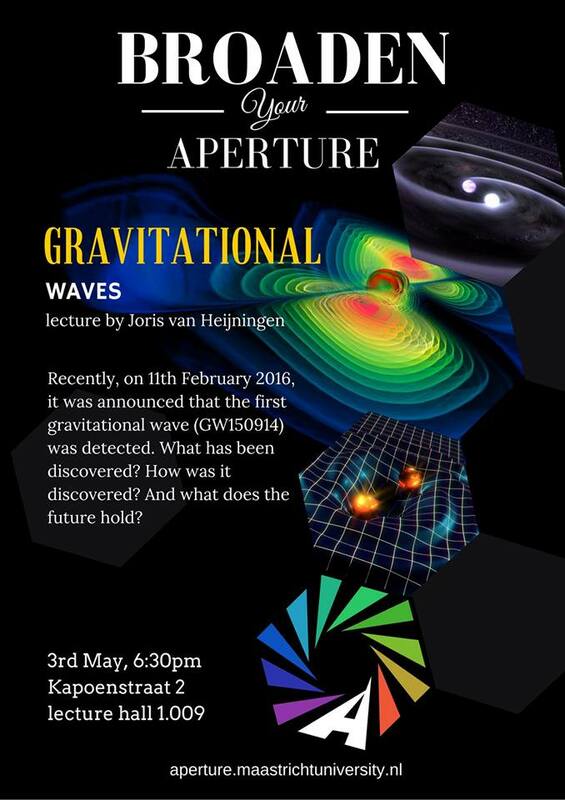 Join us for our 7th edition of Broaden Your Aperture Where the recent subject of interest, Gravitational Waves, will be spoken about by our guest lecturer Joris van Heijningen. A hundred years ago Einstein found that in his brand new Theory of General Relativity, wave solutions in space-time exist. He thought, however, that they were unmeasurable. Over 50 years ago, scientist started trying to measure these waves. Five months after the measurement, 11 February 2016, it was announced that the first gravitational wave (GW150914) was detected. What has been discovered? How was it discovered? And what does the future hold? Joris van Heijningen, born in 1986 in ’s-Hertogenbosch, finished grammar school in 2004 and leaves to Delft, starting his Bachelor in Aerospace Engineering. After a year he switches to Applied Physics, leaving in 2012, after presenting his M.Sc thesis Applied Physics, for half a year to SLAC, the linear accelerator of Stanford University in California. Back then, he wanted to start his PhD at CERN, but the available options are too much ‘behind a screen’ and too little ‘wielding a wrench’. 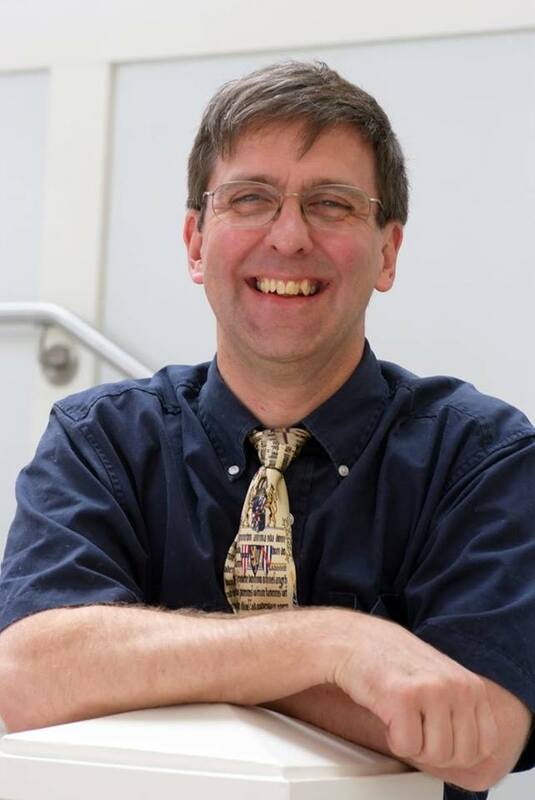 He does find this balance at the National Institute for Subatomic Physics Nikhef in Amsterdam, working in the group of Jo van den Brand: Gravitational Physics group. Higgs and the mystery of missing antimatter. With the discovery of the Higgs boson the Standard Model of elementary particles is said to be complete. We know what the fundamental quanta of matter and forces are, and we have an explanation for the origin of mass. However, a big mystery remains: the mathematical symmetry of the theory predicts that the big bang should have produced equal amounts of matter and antimatter! How can it be that antimatter is produced by collisions in particle accelerators, but that is does not naturally exist in the universe? This is the central question of the lecture. The topics that will be addressed are: what are the building blocks of matter and of forces? What exactly is antimatter? How does the Higgs mechanism work and what does it have to do with the missing antimatter mystery? 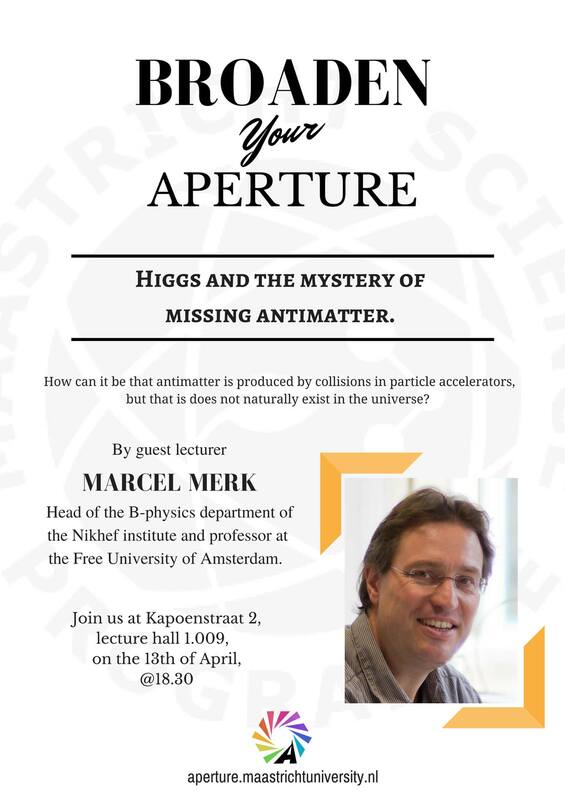 (Prof. dr.) Marcel Merk studied physics at the Catholic University of Nijmegen, currently the Radbout University. His specialization was particle physics and his PhD-research took him to CERN, where he was involved in the large LEP collider experiment. Since 1995 he is in the Netherlands working on antimatter research. Currently he is head of the B-physics department of the Nikhef institute and holds a professorship at the Free University of Amsterdam. Join us at 6:30 pm on April 13th 2016 at The MSP building, Kapoenstraat 2. The role of Materials Science in Sustainable Development. Sustainable development is essential if the world, as we know it now, is not to be destroyed. This presentation summarises key issues, why attitudes have to change, how technology must and can provide solutions, and some life-saving possibilities emerging from the development of and innovations in the use of diverse materials, e.g. metals, plastics, composites and electronic. The session highlights that, although materials and technology often are able to offer necessary and sometimes wonderful solutions, we simultaneously need to be aware that changes in human behaviour also are required. 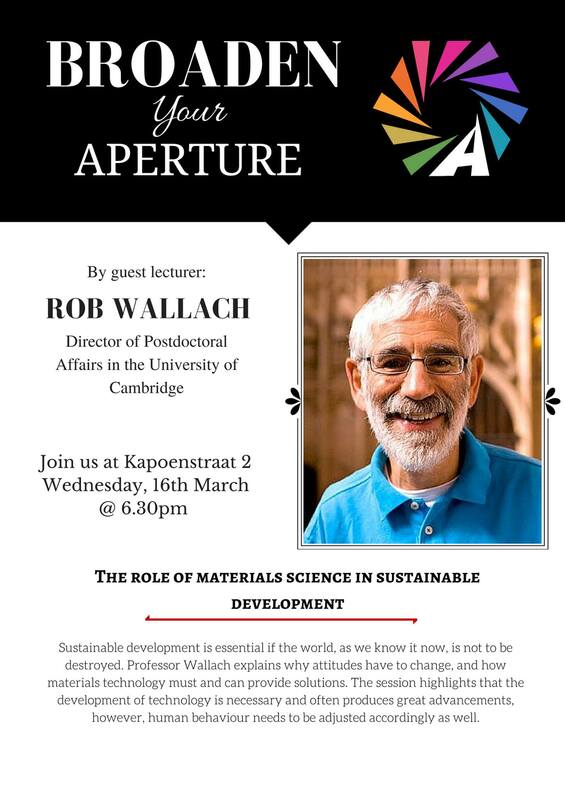 Rob is the Director of Postdoctoral Affairs in the University of Cambridge, an Emeritus Senior Lecturer (Department of Materials Science & Metallurgy), and a Life Fellow and former Vice-Provost of King’s College in Cambridge. His research has focused on the joining of materials, understanding the basic science and optimising approaches for new materials. Join us at @6:30 pm on March 16th 2016 at The MSP building, Kapoenstraat 2. In cooperation with Gaius study association, Aperture presents the 4th edition of Broaden Your Aperture this academic year. The personal medical data of individuals, from their genetic and genomic information to their medical histories and information about their environments, plays an increasingly important role in modern medical research. Today this is often included in the “big data” revolution; certainly, there are many new methodologies in medical research that seek to optimise the use of medical data, for example, biobanking and cloud computing. Whilst the use of this data promises wonderful new hopes in understanding and treating diseases, it also poses difficult ethical and legal challenges. There are possible harms to privacy and interesting questions about property rights. The new opportunities suggest a changed relationship between the patients, their health care professionals and their pharmaceutical providers. There is a sense that individuals, through the new methodologies, become more the commodities of the health industry than the beneficiaries of a service. But is this individualism going too far? If we want new treatments, we have to participate in finding them? 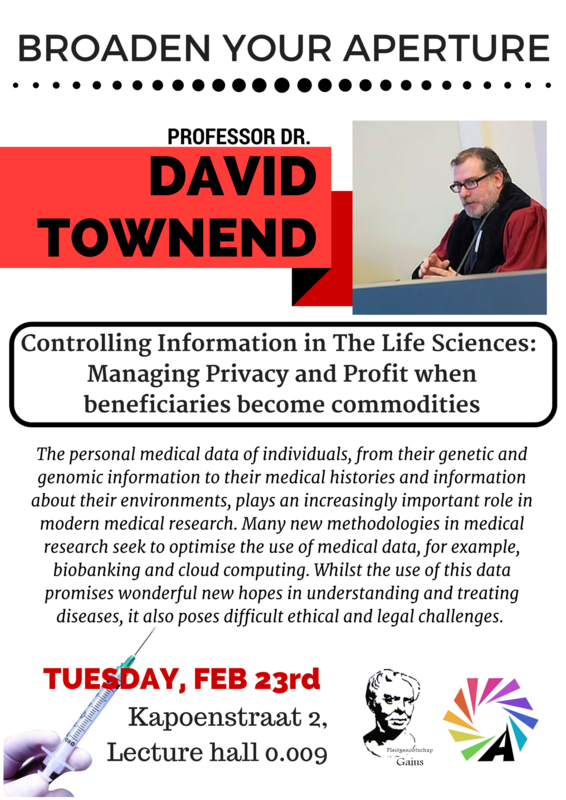 This lecture will first look at the uses of data across the pharmaceutical development line, and particularly consider the possible harms that could follow the use of the data. It will then consider those benefits and harms within the two concepts of privacy and property. Finally, it will see how far the current data protection and intellectual property regimes produce adequate safeguards for the various interests that operate in the area. Join us at 6:30 pm on the 23d of February, 2016 at the MSP building, Kapoenstraat 2! Join Aperture study association for our 3rd Broaden your Aperture! 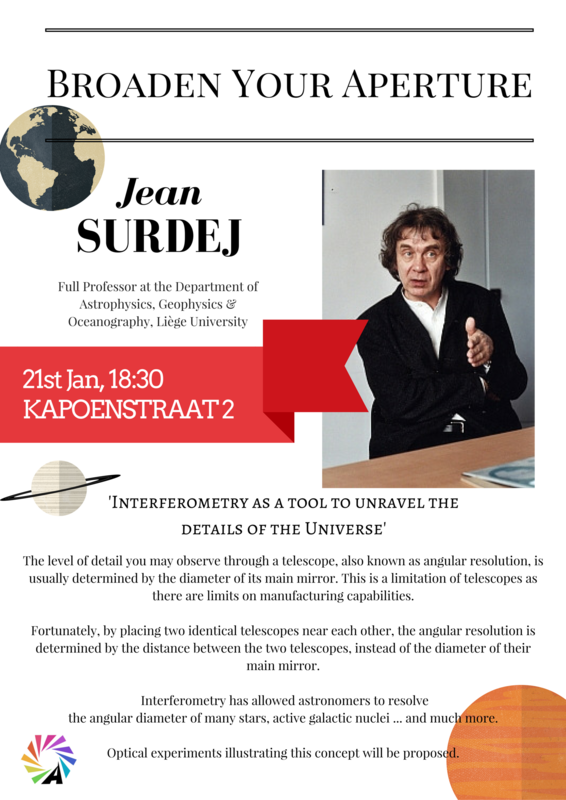 Jean Surdej, Professor at the Department of Astrophysics, Geophysics & Oceanography in Liège University, will be discussing Interferometry. The level of detail you may observe through a telescope, also known as angular resolution, is usually determined by the diameter of its main mirror. This is a limitation of telescopes as there are limits on manufacturing capabilities. Fortunately, by placing two identical telescopes near each other, the angular resolution is determined by the distance between the two telescopes, instead of the diameter of their main mirror. the angular diameter of many stars, active galactic nuclei ... and much more. Optical experiments illustrating this concept will be proposed. Join us at 6:30 pm on January 21st 2016 at Kapoenstraat 2! On April 26th 1986, the world’s worst nuclear accident occurred at the nuclear power plant in Chernobyl, Ukraine. In the immediate hours, the accident was barely understood by the nuclear scientists working at the site or by government officials who struggled to coordinate a rescue and containment operation let alone by the citizens in the immediate surrounding areas. The accident resulted in the ultimate evacuation and relocation of over 350,000 people and the clean-up and containment of the remainder of the nuclear power plant involved some 500,000 civil and military personnel. Many of these individuals are left in limbo, having never been publically acknowledged as being involved and having medical records falsified to downplay the significance of the even. However, many have been decorated with medals and having their social benefits increased as recognition of their hard work. 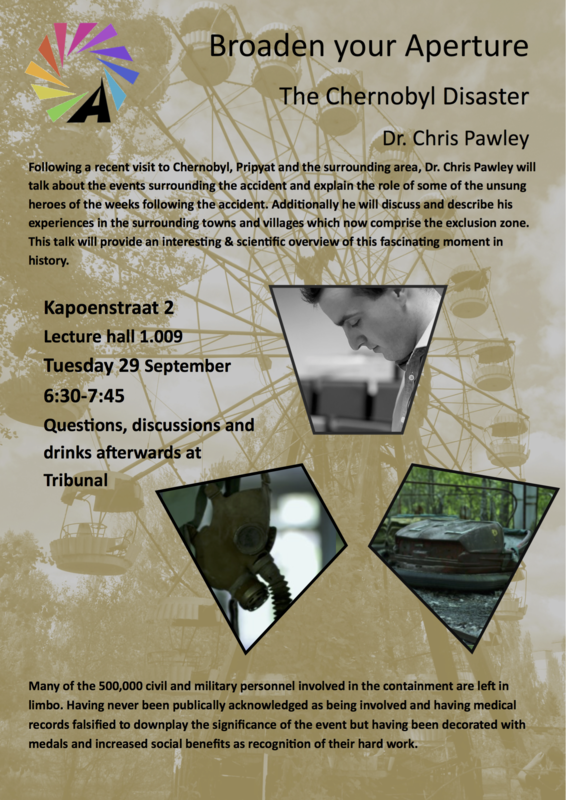 Following a recent visit to Chernobyl, Pripyat and the surrounding area, Dr. Chris Pawley will talk about the events surrounding the accident and explain the role of some of the unsung heroes of the days and weeks which followed who prevented this becoming significantly more serious. Additionally he will discuss and describe his experiences in the surrounding towns and villages which now comprise the exclusion zone. This talk will provide an interesting & scientific overview of this fascinating moment in history. join us at 6:30 pm on September 29 2015 at Kapoenstraat 2!